How to Activate and Use SBI mPassbook Facility Online/Offline? 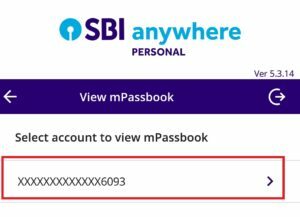 Home / Banking / How to Activate and Use SBI mPassbook Facility Online/Offline? SBI mPassbook: State Bank of India has been introducing new features for its customers from time to time. mPassbook is one such feature which can be called as the digital passbook. It is quite similar to the physical passbook which you receive from SBI while opening your Bank Account. 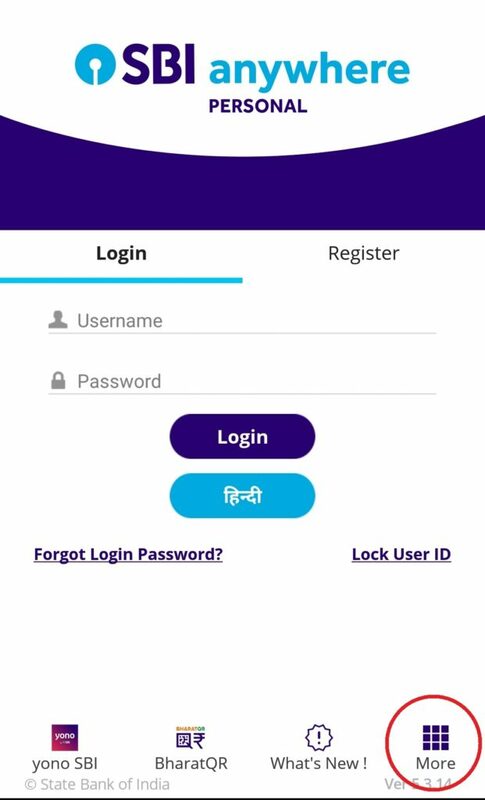 So, now all the SBI Account Holders can access mPassbook of SBI through the Mobile App by signing in with SBI Net Banking User ID and Password. SBI mPassbook is very much similar to your physical passbook as it shows you all the transaction details which have been made from your SBI Bank Account. You can use the SBI mPassbook facility sitting anywhere anytime. Not only that but you can access SBI mPassbook Online as well as Offline. By using SBI Bank mPassbook, you can easily sync your transactions by signing in to SBI Anywhere Personal App. SBI mPassbook saves you a lot of time as you do not need to visit your SBI Branch to see your transactions and update them in physical passbook. What are the Benefits of SBI mPassbook? 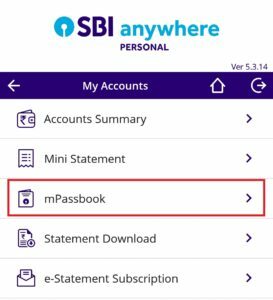 How to download SBI mPassbook App? 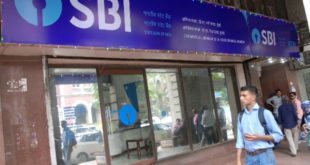 How to Create SBI mPassbook PIN? 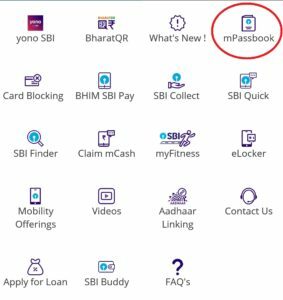 How to use SBI mPassbook Facility Online? 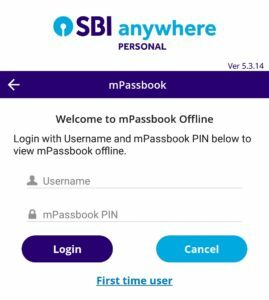 How to use SBI mPassbook Facility Offline? Can be Accessed easily : SBI mPassbook lets you access all your transactions irrespective of where you are located. So, forget about visiting the branch when you have mPassbook with you. 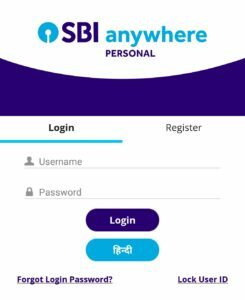 Just login to SBI Anywhere Mobile Application, complete your SBI mPassbook Signup process and sync your transaction details. Absolutely Free of Cost : If you want to use SBI mPassbook you do not need to pay any charges for it, its absolutely free for every account holder of SBI. You would just require an Android, Blackberry or iOS device. The mobile app through which you can access mPassbook i.e., SBI Anywhere is also free of cost. 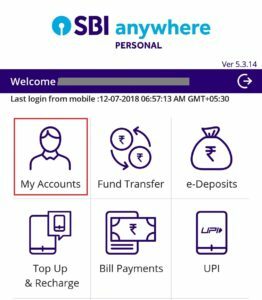 Secure and Safe : As you can complete the SBI mPassbook login through SBI Anywhere app by using your User ID and Password, it can be considered as very safe and secure. This doesn’t let anybody else login to your account without knowing your User ID and Password. We would like to make it clear that there is no particular app for SBI mpassbook. However, you need to download SBI Anywhere Personal App to access SBI mPassbook. As a lot of people use these two terms interchangeably so we would be using them interchangeably in this article (i.e., SBI Anywhere App and SBI mPassbook App). 1) Sign in to State Bank of India Anywhere App using your Smartphone. 2) Click on ‘My Accounts’ . 4) Now click on ‘Generate/Reset PIN’. 5) Enter your 4 Digit PIN, confirm the same PIN again and click on Submit. Once you click on Submit, your mPassbook PIN will be generated. 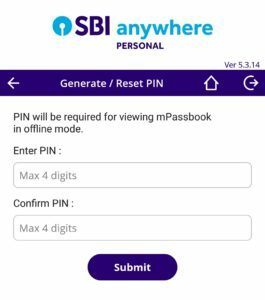 Do remember that if you want to access SBI mPassbook offline, you will need this 4 digit PIN. 1) Login to SBI Anywhere App using your Internet Banking User ID and Password. 3) Then click on ‘mPassbook’. 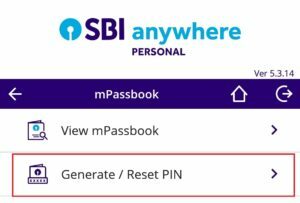 4) If you are a new user you will need to Create SBI mPassbook PIN by clicking on ‘Generate/Reset PIN’. Even if you click on ‘View mPassbook’, you will still be prompted to Generate SBI mPassbook PIN. Those who have already created a PIN for SBI mPassbook, can jump to step no.5. 5) Now you can click on ‘Sync Now’ to see your latest and updated transactions on SBI mPassbook. 6) Now select your Account to view its transactions history. You can also go back and click on ‘View m-Passbook’. You will now be able to see all the transactions of your SBI Account as shown below. Let us now tell you the procedure to use SBI mPassbook offline i.e. without internet connectivity. Not only SBI gives you the facility to use SBI mPassbook online but it also offers you this facility offline. In order to access and use SBI mPassbook Offline, you do not need any internet connectivity. You will just require your net banking username and your ‘mPassbook PIN’. 1) Open the ‘SBI Anywhere’ app on your device/smartphone. You would find a link named “More”, click on that. 2) Click on ‘mPassbook’. You will then be asked to enter your Net Banking User ID and mPassbook PIN generated earlier. 3) Enter your SBI Internet Banking Username and the 4-Digit PIN created for mPassbook. 4) Now you need to Select the Account for which you need to see the transaction details. 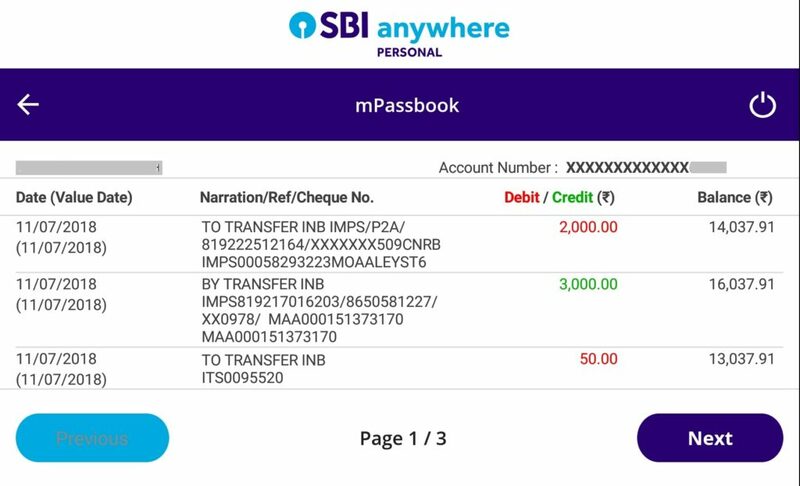 As soon as you select the Account, you will be able to see your SBI mPassbook in landscape mode. It will show you all the transactions which have been synced with the device. You will not find the ‘Sync’ button in offline mode. Q.1) What is SBI mPassbook? A.1) SBI mPassbook is a digital version of physical passbook which can be accessed through your smartphone. It can be used to check your latest and updated transactions synced to your device. Q.2) Can SBI mPassbook facility be used on any phone? Q.3) What all do I need to use SBI mPassbook facility? A.3) In order to use SBI mPassbook facility, you must have an Android, Blackberry or iPhone with internet connectivity like GPRS/EDGE/3G/Wi-Fi. Internet connectivity is required to create your mPassbook PIN. Once you PIN is created, you can access it even without any internet connectivity. Q.4) How do I use SBI mPassbook? A.3) You can use SBI mPassbook via SBI Anywhere mobile application. You would need SBI internet banking username and password to access your mPassbook Online. However, for accessing mPassbook in SBI Offline, you will need your net banking User ID and mPassbook PIN. Q.5) Are there any charges for availing SBI mPassbook facility? No, SBI mPassbook facility is absolutely free to use. 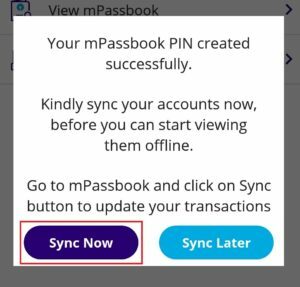 Q.6) I cannot see any sync button on my mPassbook offline. Why? A.6) As the offline mPassbook can be used even without internet connectivity, you will not be able to latest transactions. If you want to update your latest transactions on mPassbook, you must sync your transactions by loging into SBI Anywhere App. 7- How secure is SBI mPassbook? No personal data would be saved on your SIM Card or Phone. You cannot login to this App without Net Banking username and Password. Once you close the application, the session gets expired. The session automatically gets expired if there is no activity for 5 minutes on the app. SSL encryption is an added security layer to protect all kinds of communication with SBI. Q.8) What if I do not have internet banking username and password? You will not be able to access SBI Anywhere app without your internet banking username and password. 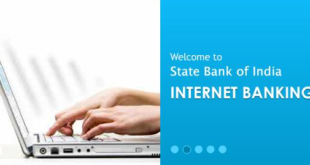 So, you must register for SBI internet banking by visiting SBI Online website or your nearest SBI branch. This is the complete procedure of SBI mPassbook registration and how to use it. We have also told you the procedure for State bank of India m passbook download for your Android, iPhone or Blackberry device. As we said you can use this facility online or offline. So, even without any internet connectivity you can have access to the transactions made in your SBI Account. You just need your Internet Banking user ID and mPassbook PIN. Next How to Register Online FIR in UP(Uttar Pradesh) Police? 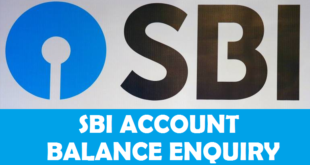 How to Check SBI Account Balance and SBI Mini Statement? How to Add Beneficiary in SBI Net Banking ?